It was 4 years ago that we had started searching for a plot. Realizing that the rates on this side of ring road are affordable in south Bangalore, our search was primarily in this area â extensions of Padmanabha Nagar. Lots of sites had some issues or the other. Those which were neat did not suit us. Some of the plots which we had accepted sold out like a hot cake in less than half a day. After beating all odds, 2 sites made it to final selection. Both were âlikeâ? corner sites. The roads stretching to âfutureâ? main roads. Both had a âgarden/ public parkâ? being planned near by. Etc etc was the rosy picture shown by the real estate agents. Not satisfied, we went for our private survey. The âfuture-probableâ? neighbours know it best. âBad choiceâ?, was the honest, blunt reaction from the first one. All the above attractions turned out hoax. Many other critical problems were made known. The site owner had buried his parents, wife in the residential plot! âBhoot! !â?, the first choice was out. Quite farther from the main road, compared to the first, was the second choice. Peaceful, dust free, shady, green â this area resembled a quiet village. A single house for the entire road ensured the privacy and calmness. The coconut trees to 3 corners instantly made me love this place. Encouraging comments from our neighbour strengthened our choice. The attractions mentioned by broker were not completely true, but that had no impact on our decision. 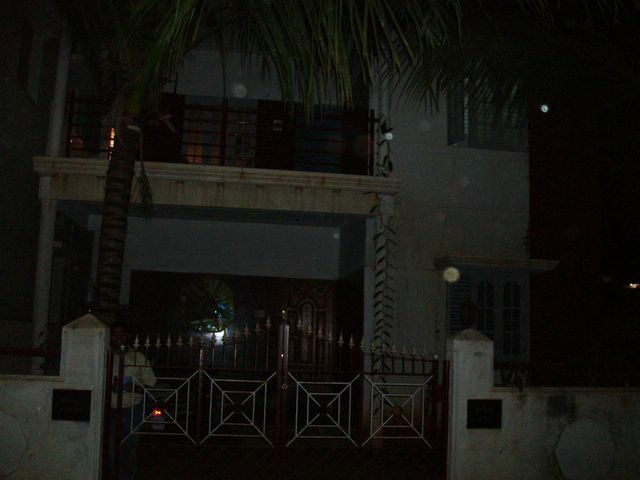 Artistically and innovatively we named our home “Srigandha”(Sandalwood in Kannada), where we started living from the very day of house warming, though partly incomplete then. The area is no longer an extension but has extensions. The next road to our house is main road on which BMTC buses ply. Education institutions, hospitals, petrol bunks are born overnight. School buses and other construction vehicles taking the immediate road has increased air and sound pollution. No more vacant plots. Park is still future. Number of coconut trees is 2, but will remain so. Various vegetables/fruits/flowers (cucumber, tomato, beans, ladiesâ fingers, pumpkin, lots of papaya,venilla etc) have grown in our area. Itâs a great feeling. Itâs a joy to observe the minute growth of the plants/vegetables every day. The scent of the soil after the first drops of rain is glorious. On a quiet evening the breeze from coconut tree branches to our balcony is heaven. Come home sometimesâ¦..Welcome to my home . . .